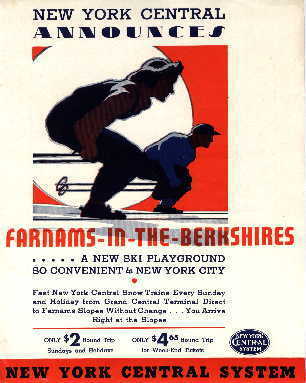 In the Berkshire Town of Cheshire MA (7 miles North of Pittsfield) was the Farnams of the Berkshires Ski Area which operated from the 1930s to the late 1950s? Trains used to drop off people near Rte 8 where the would cross the road and make the trek up the mountain. Today you can still see the remnants of the ski trail on the mountain. In the Berkshire Athenaeum in Pittsfield is information about the ski area. An advertisement for the area - just take the snowtrain right out of New York City direct to the slopes! This development consists of 225 acres of open and semi-open slopes and trails, giving a run of almost a mile. Area served by 4 tows which operate weekends and holidays. Located 8 miles north of Pittsfield on Rte 8 and on the west slope of North Mountain. Canteen. Trails: Farnam's Fairway: 1/2 mile long, 800' wide, 250' drop, 2 tows (1500' and 1200' long). NW exposure, needs 4" to ski, novice to intermediate. Upper Cut: 1/3 mile long, 100' wide, 30 degree slope, needs 4" of snow to ski, intermediate to expert. Served by upper tow. Ericksen Run: 1/4 mile long, 75' wide, 350' drop, NW exposure, needs 5" of snow to ski, intermediate to expert, served by upper tow. I was unable to find this area on Terraserver.